Lucy is delighted to return to the Nelson Centre of Musical Arts in 2018 after ten years living in Wellington where she performed in the Wellington Chamber Orchestra and the Orpheus Choir and served as a committee member of the New Zealand Choral Federation (Wellington). Lucy completed an MMus thesis in 2011 which included the bio-mechanics of vocal tone production and the close links between the voice and the clarinet. From 2012 – 2013 she was musical director of a community choir in Hamble, UK which gave regular performances in the area. 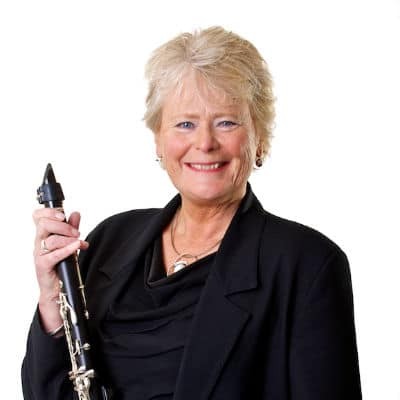 She started as a clarinet and saxophone tutor at the Nelson School of Music from 1985 to 1996, then worked as a classroom Music and Social Studies teacher at Nelson College for Girls until 2003. During this time Lucy played first clarinet and performed as a soloist with the Nelson Symphony Orchestra and the National Male Voice Choir. She also directed and performed in the Nelson Big Band and performed as a vocalist and instrumentalist in several Nelson Jazz Club ensembles. Since returning to Nelson in Jan 2017 Lucy has re-joined the Nelson Symphony Orchestra as first clarinet, she sings in the Nelson Civic Choir and takes the choir for vocal warm-ups and sectional rehearsals. Life as a musician and teacher has been a very happy blend of two creative professions. Lucy aims to inspire her students by providing personalised music programmes and enjoyable music for each student. During lessons she demonstrates and plays alongside students in solo pieces and duets. She offers regular performance goals such as playing with others in a group to encourage motivation and provide a positive reward for students’ regular home practice. Lucy enters students for Royal Schools or Trinity College Music Exams, Student Concerts and Scholarships at the Nelson Centre of Musical Arts. Above all she believes in quickly building a rapport with her students so that the lessons are interesting and engaging. Weekday afternoons by arrangement. Please enquire for further details.